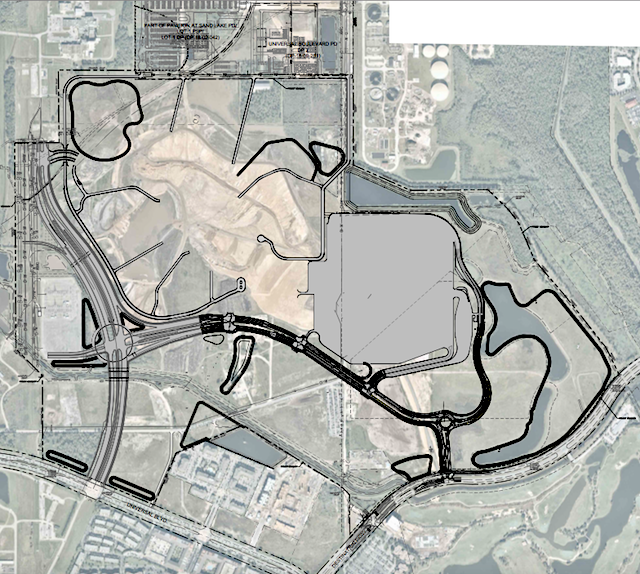 February 12, 2019, 7:10 PM · Last fall, we showed you the public documents that Universal Orlando had filed with Orange County (Florida), detailing the site plan for its "fourth gate" development near the Orange County Convention Center. Today, Universal filed a revised map for those plans, accompanying a letter detailing the company's response to notes by Orange County staffers reviewing Universal's plans. There's not much significantly different about today's map from the original one filed last October, save for the addition of several access roads from the perimeter into the heart of what presumably will be the site of Universal's next theme park. Here's an aerial map, included in today's filing. The solid gray space to the right is the 5,000-space surface parking lot that will serve the theme park. The big road on the left is the expansion of Kirkman Road, which will connect with Universal Boulevard at the southwest corner of the property. Here's a link to the current Google Map of the site, if you are not familiar with the area and like some additional context for what else surrounds it. Universal's application describes the site as 541.5 acres, including 5,089 provided parking spaces. The site's maximum allowed building height is 400 feet. There are 135 acres of open space required for the project. Orlando-based Kimley Horn is the engineer of record for the project. The case number is DP-18-10-356. Universal has told team members that the expansion project on the site will be a new theme park called "Universal's Fantastic Worlds," though rival Warner Bros. has filed for time to potentially dispute Universal's trademark application for that name, presumably due to the use of words in Warner Bros.' "Fantastic Beasts" and "Wizarding World" trademarks. Universal licenses Warner Bros.' Harry Potter franchise and its associated trademarks for theme park attractions worldwide, but it's one thing to license a trademark and another to register it for yourself. So for now, the name of the park effectively is Universal's Legal Adventure. Forget Fantastic Worlds. The park should be called Universal’s Florida Adventure, and be filled with generic carnival rides vaguely themed to the state of Florida. It will be cheap to build and be very successful because its got Universal in the name, and because of its proximity to a significantly better park. Its a guaranteed success! This information is a bit disappointing. Why not maximize the space on this new plot of land, instead Universal is building a 5,000 car SURFACE lot. This should be a parking garage. I don’t get it. And the park layout and potential hotel plots that would branch off from the three intersections on the new road (Universal Way) across from the theme park and the adjacent surface parking lot is boring. Universal has the opportunity to do something innovative and new, but instead they seem to be following the same-old same-old resort design. This design is nothing new, it’s simply just another theme park. That’s it. Oh well, bring on the fifth gate for WDW! I wish we could bring on that fifth gate conversation for WDW and hopefully we will someday. The public filing regarding the infrastructure for the reacquired acreage is all over local media today in Orlando to a degree that anyone would be forgiven for believing that Universal had already officially announced and confirmed their Orlando expansion plans. The constant "leaks" regarding supposedly internal documents and concept art really make this seem like an exercise in passive aggressive marketing and PR. I especially enjoyed how one local tv station took this as an opportunity to fly their chopper over IOA to confirm details regarding Hagrid's Magical Creatures Motorbike Adventure as well as the coaster work at Jurassic Park. It is a huge plot of land large enough to build as much as Universal Orlando Resort has on its existing, original property so still believe there's plenty of room to make this expansion exciting and enticing in its own right. Just not expecting wow factors in an infrastructure plan. The filing says that the project may be completed in phases. Now, that's likely just CYA legalese, but remember that UOR's original site started as one park with a surface lot, then they built the garages and additional parks later. Universal could do the same here. Robert is right. Of course projects like this move in phases. They will start by using only part of the land, and as soon as the hotels/entertainment start materializing they will turn 1/2 of the lot into a parking garage. Then the other 1/2 will follow. To think that Universal has not thought this out on a many-year many-stage basis is very naive. They designed and built one of the best theme parks in the world with Islands of Adventure, which opened nearly two decades ago. They shocked the entire theme park industry with their designs for Diagon Alley, Hogsmeade, and Hogwarts Express, essentially bringing Disney to their knees (recall that Disney had been suffering from a severe lack of investment and innovation). Universal will build a new park, and it will start off very strong. They will continue to develop and improve that area over the next several decades, as they have done with their original properties. There have been some suggestions in other threads that NBCUniversal won't be a long-term owner of the parks, but there is no evidence to support that. Quite the contrary, NBCUniversal has stated that the theme parks are one of its strongest performers and that they plan to invest quite a bit of capital into them every year for the long term. DB writes: "There have been some suggestions in other threads that NBCUniversal won't be a long-term owner of the parks, but there is no evidence to support that." I Respond: "No evidence?" The Universal parks have changed owners as often as some people change their socks. General Electric, Seagrams, NBC/Universal, Comcast, The Blackstone Group, et al. What's more you talk about improvements being made "over the next several decades". You're willing to bet that there won't be a new ownership group between now and 2075? This layout seems to exclude a hotel attached to the theme park (like Disney is building at Hollywood Studios?). I mean it COULD be possible, but as I see this map, that doesn't seem likely. I guess that rules out a Harry Potter hotel dumping into a Harry Potter land. I also find it interesting how the parking area is the east/south east of the park while the rest of the resort is north/northwest. I was expecting more of a staging area for Guests arriving from the rest of the resort and guests visiting the report specifically. EPCOT's entrance came to mind with guests arriving by monorail, skyliner, buses, and cars. TH writes: "No evidence?" The Universal parks have changed owners as often as some people change their socks. General Electric, Seagrams, NBC/Universal, Comcast, The Blackstone Group, et al. I Respond: The past does not equal the future, TH. Unless you have a crystal ball, you cannot predict the future. BTW, NBC/Universal has the parent company Comcast, which you listed separately. TH writes: What's more you talk about improvements being made "over the next several decades". You're willing to bet that there won't be a new ownership group between now and 2075? I Respond: See my answer to question 1. Post-HP Universal is turning out to be an amazing business, and the upgrades keep coming. Comcast/NBCUniversal, at present, likes the business and plans to stay in it for the foreseeable future. Again, neither of us can predict the future. Media companies are in a huge state of flux right now, and the landscape beyond is quite unpredictable. Keith: "This design is nothing new, it’s simply just another theme park. That’s it. Oh well, bring on the fifth gate for WDW!" seriously? is this for real? this can't be real life. people write off a brand new full US theme park .... wait for it ... based on the parking lot. No Jurassic World, no LotR, no Universal Monsters, no Star Trek...yes, Universal’s Fantastic/Epic Worlds is getting me really excited! I don’t see Comcast seling off Universal in the near future as it is a source of IP content and it falls into their business model. I agree with Dr_Venkman. This falls under the realm of "how do you get people to complain on the internet: post something". Keith -- Do you have inside info that confirms what you stated? I'm not sure, based on what I've seen, that this is entirely accurate.